Arunachal Pradesh Agriculture and Allied Sectors Minister Dr Mohesh Chai emphasized on giving more focus to market infrastructure to improve forward and backward linkages so as to ensure remunerative price of surplus agri-horti produce. This was Chai’s first meeting after assuming the ministerial charge of the department. Appealing to the officers of the department to discharge their duties in team spirit for the betterment of farmers, the minister further explained that the objective of the meeting was to interact with the officers of the agriculture and learn about the activities undertaken by it under the Central and State sector funding. He also sought for suggestions to ensure the convergence of agriculture and its allied sector activities. Chai further called upon the officers to properly document all successful projects that were and are being implemented by the department. Modalities for proper implementation of Chief Minister’s Krishi Rinn Yojana, Prime Minister’s Fasal Bima Yojana were also discussed in the meeting after which the minister advised the officers to convene separate meetings with the NABARD and commercial banks in this regard. Earlier in his welcome address, agriculture director Anong Lego briefed the minister and parliamentary secretary about the ongoing activities of the department while AK Purkayastha, advisor of the department elucidated the house on the backdrop, status and strategy for doubling of Farmers’ Income by 2022 as envisioned by the Prime Minister of India. Issues requiring attention of the State Government for inclusive growth of farm sector were also highlighted in presentation Purkayastha’s presentation. 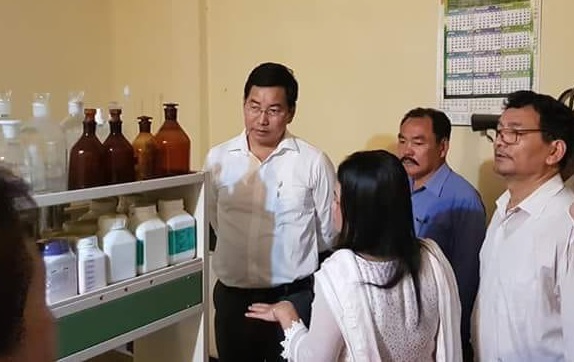 Dr Chai and Jamoh on the day also visited the State bio-control lab, seed and soil testing Lab and interacted with the officers concerned.